EDC Creations Virtual Book Promotions--Thank you for purchasing a publicity package from us today! Join us weekly for the most stimulating conversation on the planet! African American community leaders, authors, writers, poets, and book lovers come together 3 times a week to discuss things that matter the most in our communities. Join us and become part of our family! Your actual interview on BTR is FREE at all times. Guests make payments to cover the additional exposure for the interview hosted by Ella Curry. During the month we host a number of high profile events that generate alot of traffic to our radio feeds and blog sites, it costs to maintain the operation behind BAN Radio, thus the fees for promotional services and ads placed on our shows. All interviews are fee based. Our vision is to build the most successful network of readers, authors, business leaders and publishers by bringing together the talents, efforts, and relationships necessary for a greater collective success. At EDC Creations every client is vital to us and our community. Your success and ours are truly dependent on each other. Without your support, we cannot deliver the information and resources that are so important to millions of people who read in the world. We will give our all in order to help you meet the challenges you face by developing innovative programs that really work, with the audience we have come to know and love. Through the ups and downs of these trying times, our partners and loyal supporters have stuck together and have emerged as industry leaders in building rich, credible, and inviting communities for people around the world, and from all walks of life, whatever their interests and lifestyles. We strive to continue to bring you the most stimulating content on the web. Take a moment and examine the services we offer business owners, authors and publishing house--traditional and independently operated. Feel free to email us with any questions or comments. How does BAN Radio work? Should we invest more into your dream than you do? Most Blogtalk Radio hosts depend on the actual chat room head count to determine if they have a popular show or not. EDC Creations does not. Our audience is not entirely in the BTR chat room. They live around the globe and come from all walks of life. Most are busy people who want to enjoy the show on their own time. We have millionaires listening in Las Vegas and little housewives in Dublin! We know because they reply to us, from the email newsletters with much praise about the people we bring to empower them. They also go to iTunes, Podbean, 130 of our social network profiles and the BAN Radio Show homepage to download the shows weekly. Our fans receive our shows in their email accounts, so they do not have to stop their lives to come in the chat room. They love us for making life easier! EDC Creations goes beyond the chat room to let people know about you and your product. A BTR chat room can only hold a few folks, but our RSS feeds can entertain and educate all 152, 000 of our EDC subscribers weekly! BTR is not a free medium. EDC Creations pays a monthly fee to host the show on Blogtalk. We love them for offering the public this service. 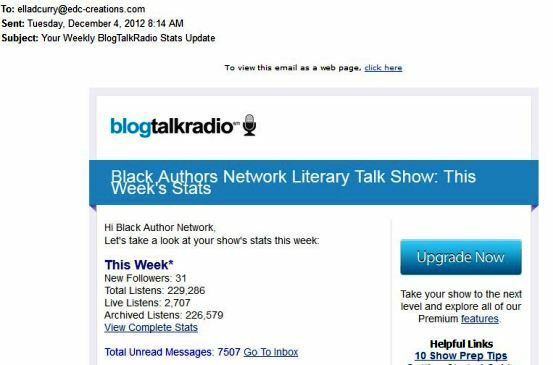 We could not host the Black Authors Radio Show, on BTR, if they were not so generous, we so appreciate it. We do not charge anyone for interviews. However, EDC Creations is a full time marketing and promotions firm. We require the administration fees to help cover the cost of promoting authors in our network. Sharing your book or product with a global market; we do not charge for coming on the air at BTR. The experience of dealing with a publishing industry insider and business owner, beats handing your book promotion over to a host who only offers a 1-hour chat room spotlight! -|- Average 900 or more downloads/listens per radio show, view here. Tell the world that your book is out! Small business owners, event planners, personal coaches, publishers, artists, have a new product, service or a event that needs exposure? Tell our listeners today! Create an audio introduction, reading and sales pitch that will be played on BAN Radio Show 6 times on 6 different radio shows in 30 days. The author or business owner will receive the full instructions via email, after payment. Fee for service: $199.00 for 6 different radio show spotlights in 30 days. Advertise your book or business with a special audio presentation. The radio commercials will be played on BAN Radio Show with host Ella D. Curry. Pay for your advertisement at the Payment Center below. * AudioShelftalker page remains on EDC Creations' site for 90 days, view here. * Samples: Lutishia Lovely. Alexis Herman. Kimberla Lawson Roby. Leonard Pitts Jr.
* Interview on BAN Radio Show for 30-45 minutes. We were selected as Featured Hosts at Blogtalk Radio! At the present time, our shows are averaging more than 1,200 downloads per show! View the stats for one week, click here. The radio show creates its own newsletter that has 118,000 subscribers. The RSS feed from the show is listed in 130 podcast and blog directories. This means that millions of people have the potential, the opportunity, to hear your interview with Ella Curry and to obtain your book information. View the stats from one of our shows with 24,000 downloads in a single week. Click here to view the screenshot. Listen to the BAN Radio Show with 24,000 downloads, click here. The Black Author Network (BAN Radio) is a weekly online radio show that features authors and literary leaders three times per week to give the readers a blast of knowledge, wisdom, and empowerment. Our philosophy is one of positive self-image and empowerment. We are dedicated to promoting the advancement of multicultural, diverse books in all aspects of business and social networking. Using author interviews as the theme for each show, book lovers get a first-hand look at the “behind the book” news, as the authors and host, Ella D. Curry, share the storyline of new book releases. We respect our readers’ intelligence and strive to deliver shows and books that enrich their lives. We come to the readers each week to invoke dialogues on increasing literacy for future generations, to enlighten the community on great books, and to empower our readers with the Gift of Knowledge! Join us in serving as a collective voice committed to providing quality literature to an international audience. Tune in each Monday and Wednesday night, 8-10 pm EST at: BlogTalk Radio or call into the live radio show at: (646) 200-0402. If you would like to schedule a special 1-hour feature on BAN Radio discussing your book, business or event there is a $75.00 admin fee for the showcase. Email Ella to host your radio broadcast. The fee covers the full promotion of your event to the EDC Creations network. You are welcome to invite book reviewers and fans on the show. Your book will be showcased in a group eblast from EDC Creations. This is NOT a private showcase. There will be another author featured on the show. View the stats from a new authors special showcase. Listen to the sample radio show here. For private showcases, purchase the Virtual Book or Product Release Party, shown below. A Virtual Book Release party consists of EDC Creations arranging for book clubs and readers to join the author in the Black Authors Network chat room. We will have a ball discussing the book and the "behind the scene" information into the creation of the book. View a sample release party here with Kimberla Lawson Roby, go here to listen. The photo below is a copy of our reported stats for the BAN Radio show as of December 4, 2012. We are increasing our audience weekly with Twitter updates and followers! The author will be interviewed, on the air of BAN Radio Show, with Ella Curry for 1-hour. The author will perform a live reading from the book too. The author invites their entire network to join in the party. Reviewers or people who have read the book, will call into the show to add support or to discuss the book. The author chats in the chat room during the interview, answering questions there as well. Listen to one of our BAN Radio show parties with author Monique Mensah, that has 4,721 downloads as of December 9, 2012 and climbing. The featured author's books are sold directly from the chatroom, during the party. This promotion includes a email blast to the EDC Creations database of readers after the show. The re-broadcast of the interview is available in 130 RSS feeds, including iTunes! To date we have sold over 3,870 books at our virtual release parties and online events, from the EDC Creations bookstore (stats as of Dec. 9, 2012). There is no way for us to know how many books sold from other locations, but we can let you know how many books we sell in our online store. Email the following material to this email account only: edc_dg@yahoo.com. Please make sure your information is correct before sending. No refunds after the promotion has started. We reserve the right to refuse service to X-rated material. No revisions. Editing will require an additional fee. Do not send more than 2 Word documents with this information. Combine all small documents into one large document. Please obtain legal permission from your publisher to use all images, excerpts and audio snippets. The author is responsible for acquiring the permissions BEFORE submitting to us! 152,000+ subscribers, we found out the following information about our readers. These numbers are based on 91% participating in the survey. The readers were surveyed on the Black Authors Network and Black Pearls Magazine potential to educate and entertain them weekly. Read the summarized data below to obtain a snapshot of the purchase power of our readers and subscribers. We use this information to determine our campaign approach. 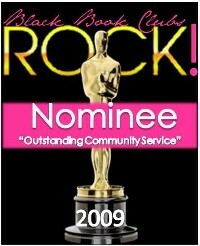 Visit the highly popular Black Pearls Magazine brought to you by EDC Creations!